I have seen quite a very many (!) butchered Fender Hotrod amps. People get a mod kit (which would be fine if installed correctly) and try to install it without the proper skills and tools. Then, the PCB traces get damaged and sometimes the problem is very difficult to find. I had one of these in last week and there was a PCB trace that looked fine, and tested as having continuity..yet, the amp popped and sputtered a lot until it had warmed-up. As it turns-out, there was a tear in the PCB trace. When the amp was warm the gap between the two segments made a good connection (since the metal traces expand when they get hot ), but when cold the connectiuon was not 100%. Pop Pop crackle….sputter..etc. So please folks, be careful with your amp modding! I re-designed the basic Sunnyside Amps aluminum chassis to make the build process more efficient. 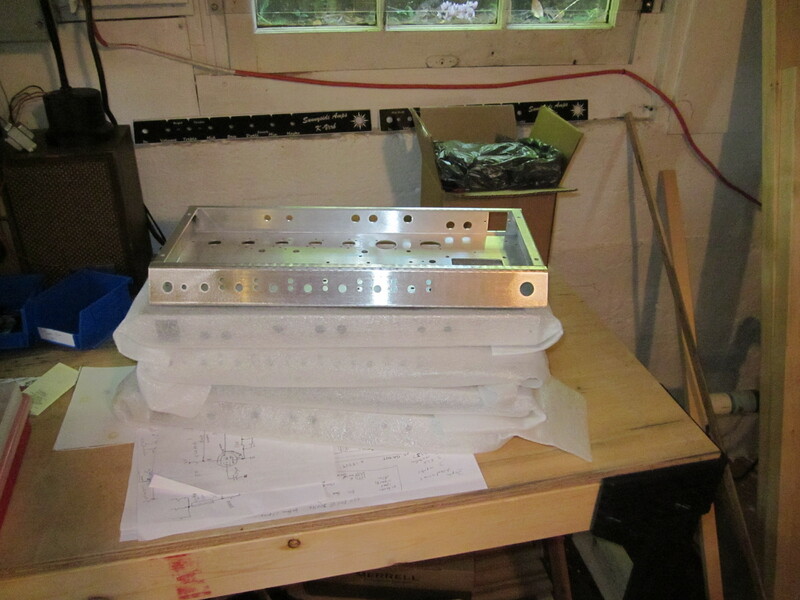 I just received a stack of new chassis’…..They look sweet!